Hey Camille ~ have you heard the news? You've been named the Princess of First Quilt Flashers! It wasn't me. I'm just passing along the good news. Pat is the one who decided you were royalty. She slid in under the wire with a post about her first quilt ~ it's pretty funny too ~ and she's named you a Princess of the realm. Or a flasher... one of those. Did you think this little parade would turn out to be so big? I admit it, I thought ten, maybe twelve, people would take the time to dig out their first and most recent quilts, take a couple of pictures and post about them on their blogs. Fifteen, tops. But never did I think it would be this many. I lost count. I might have kept track but I don't have that many fingers and toes. I saw your post about the parade and I love that you posted all those awesome quilt pictures in with the links ... wish I'd thought of that. But you're better with pictures so it's probably best that you handled that anyway. So since I'm a talker ~ yeah, like that's a news flash! ~ I'll just post random comments about how amazingly cool this whole parade of quilts turned out to be. I loved all the awesome lessons that everybody's learned over the years. Some of them were "life lesson" kind of things and some were just really good quilting lessons. Can you believe that quilters actually made quilts without rotary cutters? Cardboard templates? As if?!? How funny was that fabric from the late 1970s and early 1980s? Do you think someday we'll refer to time as B.M. and A.M.? Before Moda... After Moda. I love that there are so many new quilters! Can you believe how many there are? And all the young women who are quilting! Well, that probably doesn't surprise you, but we do have that image of quilters being grandmas. I've always thought that I was on the "young side" of quilters since I'm still many years away from being "the average age" but, thanks to all the new quilters who posted, I now feel really, really old... ancient. Vintage. Heather ~ Quilt or Stitch? Janet ~ What comes next? I enjoyed reading how so many of us have learned the same lessons ~ and how often we had to learn those lessons for ourselves even if we had the opportunity to benefit from someone else's experience. It seems that we quilters are a stubborn lot in that regard. We have to learn some lessons the hard way... or the lumpy, poufy way. Did you tell everyone about the prizes? I'm doing two and you're doing twelve... did I get that right? V ~ V and Co.
How cool is it that so many of us are still hand-quilting their quilts... well, not me, but other quilters? I loved reading that. I hand-quilted a few small projects way back when I was younger, and I recently took a hand-quilting class to get back to doing it. Don't tell anyone but my fingers are still sore! When people talk about "no pain, no gain", it never occurred to me they were talking about quilting! I also love that so many quilters are machine-quilting their own quilts ~ even big quilts! Did you know that Harriet Hargrave calls machine quilting "hand quilting with an electric needle?" I also loved reading how proud everyone is of their first quilt. No matter how icky they thought it was, they still loved that first quilt and cherished it. It is kind of like those "ugliest dog" contests, the quilts with the ickiest fabric, the highest polyester content, and the worst piecing were deemed the "most wonderful quilt". And while I can't speak from experience on this one, I love that so many quilters mentioned how supportive and encouraging their husbands and boyfriends are. And how proud they are of the quilts! If I had a husband, do you think he would have found something nice to say about my "green thing"? And would he have been like Bill and rescued it before I could give it away? And all the wonderful stories behind the quilts ~ I think that was my favorite part of this parade. Whew! That's everybody that posted their link here. I stole your picture... no, wait, you sent it to me! Then it's okay to use it. By the way, I really love that chair. Did I ever mention that? There is one last thing to do before I head to bed ~ it's quite late! I have these two packages that are all ready to go. They've got names on them but they're missing addresses. So if you see your name below, would you post a comment to this so that I can e-mail you and get your mailing address? To everyone who posted, shared, blogged, quilted and participated ~ thank you! This has been more fun than I could possibly have imagined. I loved this post! You almost made me cry! I just have to say that all of us quilters wouldn't have this love of fabric and design if it weren't for you and Camille, and the many other quilt designers/fabric designers, out there willing to share your ideas and inspirations. So, thank you and a big hug! Hi Carrie, no, I'm not there and I did take part! I left a comment both on Camille's and your blog but can't see mine on yours... Must be a blogger blip. Never mind! I usually don't win anyway and the link is there in the parade on Camille's blog so people can come visit if they want so all good! Great initiative! Carrie, I didn't post a link as I don't have a blog but I did send my picutre of my very first quilt to Camille. Just wondered if that qualifies me for any potential prizes???? No matter, either way. 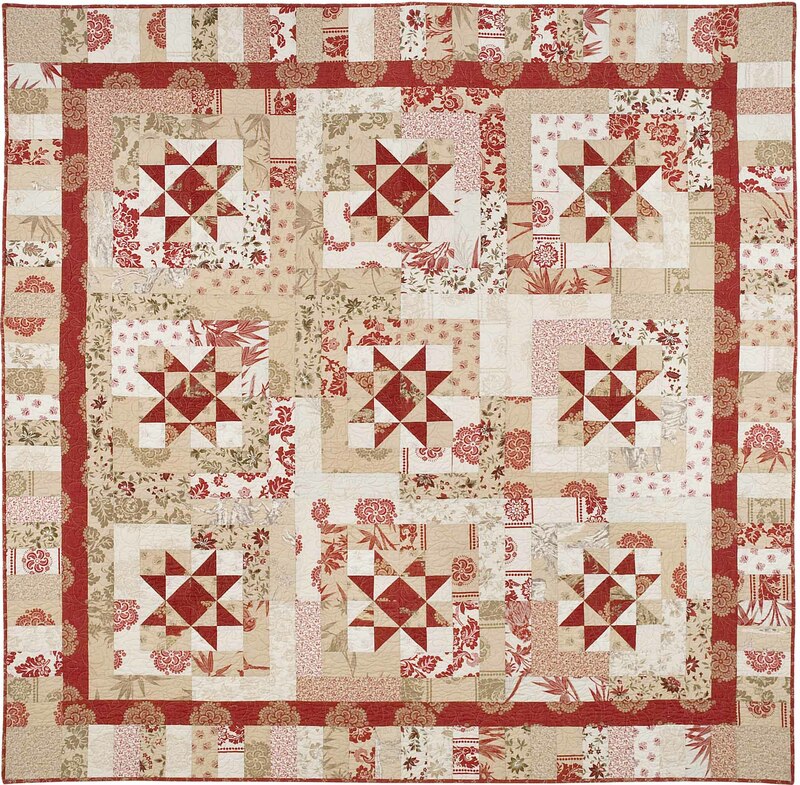 Now on to the important stuff, I adored looking at all the 'first quilts', it really was so much fun and just because I love looking at all the different ideas and how we have all grown in both work, color selection. It was a truly enjoyable (not to mention enlightening, lol) stroll down memory lane for all of us. Thanks to both you and Camille. I enjoyed reading this post because I was touched by some of the same things. I just don't think there's a better group of people than a bunch of quilters! How great is that?...to bring all these quilters together.. and from everywhere..I have lots to read yet but those I have read are true inspirations! Well I can see I won't get anything done today because now I have to go check out all those links to see everyone's first quilts! This was such a fun idea you and Camille had. I just saw your post. Am I too late? I happened to post about my quilt. Not my first, I don't have a picture of it. But it's the second one I quilted. It was for my beloved Abuela (grandmother) who just passed this month. I made it for her in 1991. It's my favorite. Some great posts with tributes to their grandmothers, blogs with music to enjoy the parade. lol How fun. Some remarkable ladies... no wonder quilting has continued to evolve. It will take me several days to visit the rest - the laundry and housecleaning may have to wait. Oh well. Thanks to you and Camille for all the fun. Anyway - I took a break to have lunch and paged down and saw my name as one of the winners. I was stunned. My email is hereslucy@gmail.com Thanks so much. Carrie...thank you so much for doing this with Camille. You two are so much fun! I am so excited to spend time going through the entire list. Have a wonderful week! This was truly amazing. So happy to be a part of it. Thanks! What fun to look at the parade of first through recent quilts. Thanks to you and Camille for hosting this fun event! When Carrie and Camille talk (post), people (quilters) listen (read)!!!! The amazing organizers are the reason this got SO big! This is awesome - so much fun to read and look at the photos and find new quilting sole buddies. Thank you Camille and Carrie! I had to laugh when you talked about husbands being supportive. In the 80s, we went on a trip around the country, with three little kids and saw multiple quilt shows from Montana to the South and the World's Fair, and we even saw the place in San Francisco that collected Amish quilts. (the name escapes me-they made clothing). Anyway, there is no way my husband could pick out my first quilt out of the scores in this house. I've been quilting so long no one even notices what I'm working on! But he's supportive when it comes time to go to shows or shopping and he's proud of that! One of his pilot friends was saying how he went to a quilt show with his wife, like it was a big deal, and my DH laughed and said he'd been to so many he lost count! And he did it more cheerfully than I would have had it been a car or gun or airplane show! Gotta love him! It's Esprit in San Francisco ( I had to google it) and sadly it seems their Amish collection is for sale. They had amazing Amish Quilts. Carrie...thanks for your comments about my quilts! Yes, I did lots and lots of sewing of clothes, etc. for many years. I learned to sew at 12 and have loved fabric and sewing ever since. Have a wonderful week! I feel like I won, too, just having Carrie and Camille leave such flattering comments on my blog! Gah! Thanks, Carrie! I visited several Quilt Parade blogs today and can't wait to visit all the others. My Favorites list is growing by leaps and bounds. Hi Carrie, thanks for hosting the quilt parade together with Camille. I hope to visit everybody in the next couple of days! So wonderful to read the stories and see all the quilts. I’m in Camille’s list. I remember I left a comment on your blog too, but maybe I forgot the verification code, because I can’t find my blogname in your list. I've never been a flasher, but hey- I guess its never too late to start! So glad I didn't quilt B.M. Much happier living in these A.M. times. There's SO much to see and visit, many thanks for this gift! I'm a first time visitor and, for the life of me, cannot remember how I came to be here. I'm really enjoying myself though -smile-. A friend just gave me her Grandmother's 1887 Singer Treadle sewing machine and Mr. Huff...my go-to sewing machine repair man... has repaired it and made it right to sew. This winter it's my intent to make a quilt...for ME!...on this machine! It seems I've given all my family and friends quilts, now it's my turn! Oh how I would love that package! I can't think of anything better than getting a package full of fabric in the mail. And my husband would love a "free" package of fabric just once! :) Thanks for your great comments and stories and thanks for all the great designing you do! Carrie, you are the best! It is Onida from William Sonoma. I know we had once had a conversation about quilting and I meant to ask you where to start with begining books, and a resource to find a local quilter.